Tip: Long hair is more work. Subjects here include grooming problems, shedding, using (or not using) the litter box, identification issues, poisoning, housing needs for cats (indoor vs. outdoor), getting along with dogs, and discussions about certain myths. For instance, cats don't really have nine lives, they aren't really aloof unless you are, they don't "go wild" if you dump them in a rural area, and our favorite: they do NOT steal a baby's breath. Puleeze. This IS the 21st century, folks. Indoors vs. Outdoors As people learn more about cats and their needs, and as more people abandon the so-called rural mentality about cats existing simply as "mousing machines," the debate nevertheless continues about their indoor or outdoor preferences. As mentioned in several places on this web site, dangers lurk everywhere for the outdoor cat. Children prefer to play outdoors, as a rule, too, but we monitor them closely and then bring them back inside. However, cats often are allowed to roam at will without a curfew, and without supervision, and that's when problems can occur. Please review the section on Special Cats. All those injuries were preventable. Is this how you want your cat to wind up? Myths One of the most ridiculous and yet still tenaciously held myths is that cats can "steal a baby's breath." Certainly years ago before Sudden Infant Death Syndrome was identified, doctors, parents, families and friends were desperate for something to blame. SIDS still remains largely unexplained, but science has learned one thing, at least: Cats are NOT the culprits. That is truly a backwards notion, held by the tenaciously ignorant among us, and usually by the less educated members of our society. We offer NO apology for this statement. Aloofness is another myth, though this is harder to dispel because a cat's demeanor, by human definition, fits the profile. The mistake we make, then, is defining cat personality by human standards. We simply have too many cats here that are not aloof, and we feel that's because we treat them with respect and appreciate their individuality. They do not rub or cuddle or purr simply because we feed them. They come to us for attention when they are not hungry, too. They lick tears from sad faces not only because tears are salty, but also stay close by when faces are dry, just watching and comforting the one who is sad. Cats tune in to our moods incredibly well - much better than we tune in to them, as a rule. Here's another crazy one: Eating raw meat makes your cat too aggressive. 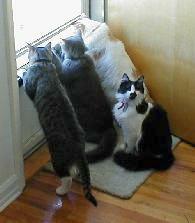 Some people actually believe that ordinary house cats will go "wild" if they eat raw meat. We feed raw meat to the cats in our shelter fairly often, sometimes as a treat, but mostly because some cats develop severe digestive problems eating commercial cat food. Putting them on a raw diet always solves this problem for us. The only behavior we've seen is that some cats may growl while eating meat. Gee. Big deal, huh? 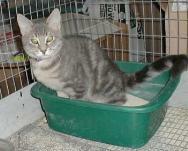 Litter Box Woes Has your cat stopped using the litter box? Stopping and never using one are two different problems, however, with different reasons and solutions. A cat that has been raised outdoors, such as on a farm or ranch, then brought inside, may not understand the concept of litter boxes. However, even they eventually prefer the sand to carpet, but it may take some time and patience to help them learn the house rules. A cat who has stopped using the box is another story, because they generally are having some "issues" about something. Shedding Hard to believe, but some people actually return adopted cats to a shelter because the hair they shed doesn't match the furniture. One can only shake one's head in amazement at this superficiality. Shedding is normal, of course, and even humans shed hair on a daily basis. But we usually can control it by combing our hair in the restroom or by the dressing table and disposing of the hair gathered in a brush or comb. And we put protective covers over drains to prevent plumbing clogs. 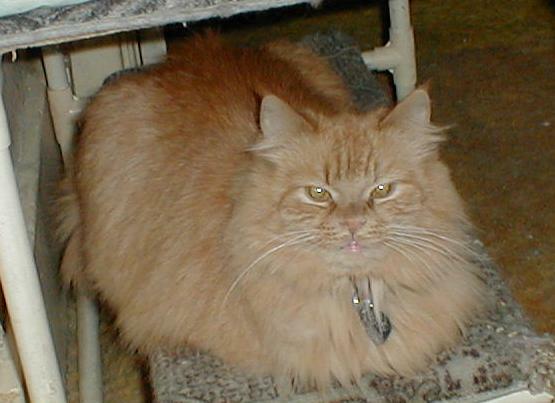 Since cats have more hair than we do, normal shedding, naturally, will produce more hair. Since we are able to control our own sloughed hair, why can we not control that of our beloved pets? Is it such a difficulty to brush the cat regularly, then dispose of the fuzz gathered? Is it so hard to cover a chair or couch cushion, or place a towel on the bed? Living with dogs Cats and dogs have learned to coexist for centuries, often forming their own special and close bonds of friendship. Stories occasionally are told of dogs that nursed entire litters of kittens, for example. But in many homes, the hostilities continue, often precluding the ownership of both. For those who wish to overcome the enmity, there are several good web sites and books about behavior and training that can help.